Record Cold in Interior Alaska – heading into the USA, agriculture at risk | Watts Up With That? reader “agimarc” writes: As with the Lower 48 states, spring is late and cold here in central Alaska. Fairbanks reported a record low of 2 degrees F above zero Sunday, breaking the previous record of 8 from 1924. Here in Anchorage, looks like we are around 3 – 4 weeks late with ice of local lakes and snow off the ground. Winter was not particularly hard, but it all changed with a very cold April. And at this point it does not appear things will be warming up soon. So much for manmade global warming due to carbon dioxide emissions. Yes, have a look at the image at right. Expect a whole new crop of record lows for the USA, and some serious issues to develop with agriculture in the nation’s breadbasket as a result. May 1, 2013 in Agriculture, records, Weather. Come on Denier! Don’t you know this is what we always predicted with Global Derping? It’s more than just Alaska. Here in Denver, on May 1st, it’s snowing outside as I write this. The trees are late leafing out this year. It’s going to be a short growing season for them. Likewise in Europe. Its been way to cold for too long now. Winds coming from the north and north-east most of the time.. Thank god no hysteria on the Weather Channel… like the one day in April it broke 70 in Chicago an Al Roker was flailing around like Ron Jeremey on a money shot. Nope, snow in May… not even a mention beyond having to give it a name. Run out of Hurrican names… ARMAGEDDON! Run out of winter storm names… Meh. Of course it was a stupid idea to begin with. Missing: Spring, if seen please return it as it’s missed. .
Alaska has extended for a second time the deadline to remove studded winter snow tires to May 15. Now a month beyond the normal April 15th date. Can someone expllain for non-Americans please? What does “2 degrees F above zero” mean? Is that 34F? The linked article says “Sunday’s high temperature was 37” and “it was just 2 degrees above zero” which seems to imply “zero” means freezing, i.e. 32F. And it’s *warming* we’re supposed to be afraid of? Yes, another snowstorm is headed into the UP of Michigan. The forecast is for up to 11″ of snow. The melt has been going on for days now, but there is still 1 to 3 feet of snow on the ground in the woods (and this area is mostly woods). March and April (now May) have been record-setting snow months. 2F is about -16C I think. 34 F would not be much of a record for Alaska. “over the past several years through his research he has come to the conclusion that we must reduce the CO2 in the atmosphere to 350 ppm in order to avoid disaster for coming generations. The Saudi “snow” is actually a severe hailstorm. Just look at the pictures. All the above are from the same report. Makes no sense to me. That’s the thing that makes the whole issue worse than a bad joke isn’t it? Since when has warmer weather ever been a bad thing? When it comes to food supplies, cold weather is a lot more scary. We grow vegetables in our (UK) garden and it is a good thing that we have the supermarket to fall back on when things don’t grow as well as we hoped for. Three or four years ago we had a non-summer that was so cold that hardly anything grew. Last year it just didn’t stop raining so we just couldn’t get out to our waterlogged garden to tend it, the only things that did well were the spuds. This year everything is about a month late due to the cold spring. I can’t imagine that there are many gardeners or farmers who still buy into the idea that it is getting hotter. 37F probably was the high for the day. “It was just 2 degrees above zero at Fairbanks” is unintelligible to most people in the world. Could all of us perhaps move to a standard temperature scale? I suppose we should get ready for $5 gasoline if the corn (ethanol mandate scam) crop is going to be hit this hard. Oh well, blame it on oil companies again as standard attack message number 52. That comes from rule number one of never taking responsibility for anything bad happening from policy decisions. Tonight’s forecast is for a low 23°, that seems optimistic with highs today in the 40s. Funny thing about Denver is the high on Monday was nearly 80! The snow fall will be hard to measure since the ground is still warm. The airport low and high for Sunday was 2F and 29F. The reported high of 37F must not be from the airport; maybe it was in Fairbanks proper or at the University. The Interior of Alaska is the vast area surrounding Fairbanks. It would seem that there is an urban heat island for Fairbanks. Just a bit of balance. You got it – 256.5 kelvins. I do think this spring is turning out to be remarkable. But let us not fall into the same mode as the warming world crowd. Weather is just that. What I find amusing is that those who would use the weather as evidence for a global trend may find themselves having to question the theory that carbon dioxide is causing a warmer world. That is their problem. As someone who likes weather, and I figure many visiting Anthony’s blog do, I have always taken note of historically special weather events. I too live in Colorado. I don’t think there is a better place in the world for seeing weather than Colorado. One story that I took note of when I first moved here over twenty years ago was about a couple of bank robbers who were tracked down because they had the unfortunate coincidence of having to excape in a snow storm. The thirty inches of snow allowed the police to track them down quite easily. While it was difficult to imagine at the time, I remember pondering the possibility of another thirty inch storm in my life time. I didn’t have long to wait. I recorded twenty seven inches of snow on flat ground, in my driveway just a few years later. We call them “dump” storms and they can happen almost any time once summer is over but the memorable ones are usually either in October or March. I am reminded of something one of my professors said: “under highly controlled conditions, children, wild animals, and the weather will do as they damn well please”. And so it is. If you aren’t humbled by it all, you aren’t paying attention. This unseasonable cold weather will remind all of those who aren’t too dumb that there is something worse than global warming. The corn in South Texas was frost damaged last week. It was planted in early March, as usual. The global warmers are gnashing their teeth at this cold weather, while farmers are praying for more CO2- it saves their crops and increases the yield. Many years ago I did a spectral analysis of annual temperature for the USGS, and using pre 1965 data (1950 to 1965 if I recall right) I found a large second harmonic of the annual signal, the phase of which might move quite a lot from year to year. A retarded phase, which we certainly saw this year in the moderate February/March period, often leads to a cold April/May. To some degree the impression of warming seasons, I think ,is actually a persistent change of phase of these harmonics. I have no idea how much snow I’ve had here (SE Wyoming) in the past 20 hours, but though it is still snowing it isn’t getting deeper on the ground. We’ve got about 14 inches now. Here in northern Alberta I still have snow and ice. My Harley is still in storage whereas five years ago I was riding long ago. The only Global Warming I’m getting is from my furnace still blasting central heat. The article says the “low” was 2F above zero which would be just 2F or about -17C rounded. The high was 37F or 3C rounded. Hope that helps. “If the weather is hot, that proves global warming. I live just outside of Anchorage. We got another inch of global warming yesterday. April was the 6th coldest on record. April was the 6th snowiest on record. They just extended the deadline for removing studded tires. April 15 is the “normal” date. On the 6th of April it was extended to 1 May. This happens every once in a while. On the 29th of April it was extended to 15 May. I cannot recall when it was EVER this late in the season before. The thing is, all the world used to have a standard temperature scale. Then you metric nuts screwed it all up. Don’t forget Oklahoma: Could be latest date for winter precipitation in some locations, and could break records for latest freeze ever in some areas, according to NOAA. “The high temperature of 29 degrees at the Fairbanks airport” —> That was Saturdays high temp. It tied the record for coldest high temp. “The temperature failed to climb out of the 20s across much of the Interior.” —> The normal high temp for the area is 53 degrees. “It was just 2 degrees above zero at Fairbanks International Airport on Sunday” —> 2F is the new record low for last Sunday. The old record was 8F. The -25 F at Umiat AK and -24 F at Deadhorse AK this morning (1 May 2013) may have established new monthly records for the coldest temperature recorded in Alaska during the month of May. small town just south of Calgary, i recorded for Environment Canada, -9.5C. In the history for this town (which does lack a lot of records), the previous low was -9.4C set in 1913…. Thanks for all the help. I think what threw me (and other non-Americans) is any reference to “zero”. Is seems completely redundant, so since it is used so often I assumed there must be a reason for it. So “2F above zero” just means 2F, right? I’m fully aware of C, F, or K conversion, thanks. Comes from here which has been a little more up-to-date lately. Daily, weekly, monthly land temp anomalies at the highest resolution available. The record cold proves Global Warming. Yes, “2F above zero” is redundant. It means nothing more than 2 degrees Fahrenheit. Some people prefer to say “2 degrees above zero” and “2 degrees below zero” rather than “2 degrees Fahrenheit” and “-2 degrees Fahrenheit”. Sure if FEELS cold but it’s a non-normalized cold. We’ll take care of that for you and then you’ll feel much warmer.. in retrospect anyway. Fourteen day forecast for Toronto, YYZ. I do think this spring is turning out to be remarkable. But let us not fall into the same mode as the warming world crowd. Weather is just that…..
and now the threat of Hekla erupting in Iceland .. anyone else expecting a ice-age ? Yes , that is correct . Citing temperatures as being either above or below zero is an American thing . Most people over here also refer to a water heater as a ” hot water heater ” and call a safe deposit box a ” safety deposit box ” even when they should know better . It’s one of my pet peeves . I lived in Fairbanks for several years from 1969 to 1972. One winter, the low in Fairbanks for a week or more was 60F below zero and the high was around 45F below zero. When the temperature gets above zero, it is usually reported that way until the summer. I think that it makes you feel warmer when it is above zero. The bottom can also drop out. One day in late October, the temperature may be running above zero and the next day, it is minus 30. Degrees Celsius = (Degrees Fahrenheit – 32) multiplied by 5 then divided by 9. But it has been a glorious day here in Scotland … first day we could really go out in shirt sleeves! This reminds me of a post by Willis back in March. Well worth a read. ………..The most surprising thing about the year was that January was a full 14°F (8°C) colder than the modern average. It would be unusual for one single temperature station to be that much colder than the climatology. But to have the average of 20 different stations being so very much colder than the climatology? 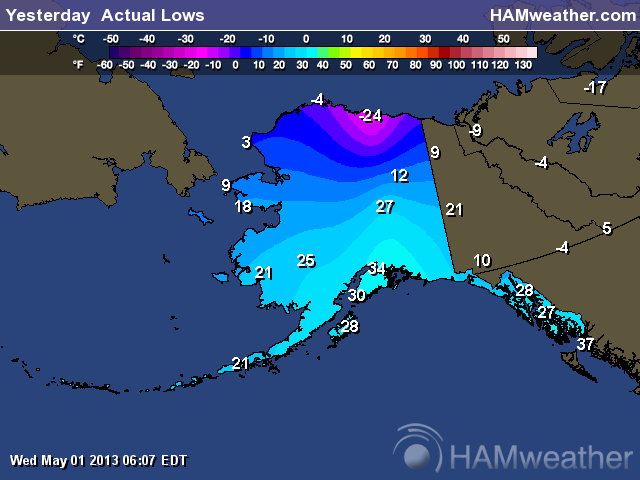 It shows not just how cold Alaska used to be, but how widespread the cold was as well. It was bitterly cold, not just in one single area but covering almost the entire state. And it was not just a cold January that year either. March was 7°F colder than usual, the summer was below average, and the start of the next winter was quite cold as well. In addition, the ice in the Bering Sea was much more extensive than usual, and snowfall was 30%-50% above normal. All in all, it was a pretty brutal time for people living the state, back when Alaska was really cold. It’s fortunate that they made tough people back then, and Alaska is full of them. You’d have to say that it was a bad, cold year overall, 2012 … I’m just glad the world is warmer now. Alaska, the canary in the coal mine of global warming. … I just love it when people talk dirty! But seriously, that sounds interesting. Did you look at longer period and what conclusions did you come to? Check out the USDA “Weekly Weather and Crop Bulletin”. Much of the US is already behind in agricultural “growing degree days” as a result of the cold weather. Now the global warming fear mongers will see how plants (and therefor food) actually prefer warmer weather. They should not fear the cold, not the warmth. Too right. My onions have only just gone in and my main crop seed potatoes are still waiting. Still, at least I haven’t had a frost to destroy my plum crop (as happened last year) … yet. Oh, and mpainter, don’t forget, -40C = -40F (= 233.15K). This cold spring will have a big effect on moose (no leaves yet), bears (many still in hibernation losing fat reserves), migratory birds (many species still haven’t arrived), and me; I’m down to the last of the firewood I cut for this winter. It’s 81 F in Oklahoma City and they already started reporting heat indexes (currently 82 F). But, in the panhandle area of OK, the temp is already down into the 40’s with wind chills into the low 30’s. We have a freeze watch for tonight with chance of sleet/snow. Gees…. I sure would like some spring before we jump into the 90-100s. It’s weather. I just came back from skiing in Banff, Alberta and it was 10 below C and snowing hard. By the time I got to Red Deer it was plus 4 C with a forecast for plus 24 C in Calgary this weekend. Lots of WEATHER. All normal for this part of the world. Five years ago must have really been the dark ages of climate science…. I would love to see Sarah Palin tell Tina Fey: “Hey come on up – now you can WALK to Russia from my house! I have always known cold weather as measured in degrees above or below “freezing point”. This works for degrees Celsius and Fahrenheit, and tells you whether you need to look out for black ice when driving. Just imagine if it were record warmth instead. It would be trumpeted to the high heavens as “further proof” of the manmade climate disaster awaiting us if we don’t act now. When I left Valdez two days ago, there was still up to eight feet of snow in town in shady spots. Canada switched to Metric in the 70s, and the worst part was that they did a “total immersion” conversion. You literally woke up one morning with all the street signs and weather reports and everything switched. It was not a good time. However, it makes much more sense to logically think of freezing as a baseline for temperature. 0F never made sense to me, it’s an artificial construct based on the freezing point of a certain concentration of salt water. In the real world what matters more is the freezing point of water. So if it’s 2F above freezing, that’s 34F. But 0C is when the roads and especially bridges are hazardous to drive on, when you need to worry about your garden hose freezing and bursting, when it’s useless to plant spring plants, etc. We’ve had -8C overnight lows two days in a row (Calgary), and that followed a dump of several inches of snow. Admittedly the snow was gone in a few hours as the daytime highs are within average ranges again. But the record lows for this date are still several degrees C colder than this. There have been years when crops could be in the ground by now, but this is not one of those years. Incidentally, one of Calgary’s record snowfalls was May 13 and 14, 1986. For the most part we got 3 feet of snow, which is unusually heavy for here. High winds meant 15 foot drifts in some outlying areas. It was pretty much gone in the next few days. Unfortunately I’ve discovered that Environment Canada’s official records of various memorable weather events do NOT match my memory. I know for a fact that in the winter of 1995-1996 we had 30 days in a row where the high did not exceed -30C, however in the official records that didn’t happen. I wonder why? Also Calgary records “official” temperatures and snowfall at the airport, which contains its own distinct weather pattern completely different from the city just a few miles away. This is why I have a hard time believing that historical records or temperature trends are accurate enough to be recording sub-degree accuracy on the century scale, and why it’s so easy for me to believe that station siting and contamination are a more likely reason for the last century’s “warming”. Yes, those poor guillemots struggling in the overheated Alaskan climate; the canary in the coal mine as Jimbo noted. On average Alaska has warmed by about 4 degrees Fahrenheit over the last 150 years. There are widespread consequences such as melting glaciers and insect-devastated forest in response to this temerature change. Scientists say Alaska is like a canary in a coal mine, foreshadowing the types of changes we can expect for the rest of the world. Now imagine that a little bit of heat is added to the system. That’s exactly what is happening in the real world; scientists say that the average temperature in Alaska has risen 4 degrees Fahrenheit since the 1950s. With warmer temperatures, some of the snow and ice melts, exposing the darker land or water underneath. These surfaces have much lower albedos – open water reflects less than 10 percent of the solar energy that hits it, for example. So more heat is absorbed by the landscape. Then a feedback loop kicks in. Ah yes, those “tipping point” feedback loops. Note the absence of mentioning the The Great Pacific Climate Shift in 1976 or the PDO. One wonders if PBS will write a followup report and highlight the fact that Alaska has actually been cooling rapidly for the last several years. Applying logic from the article, we can assume an Ice Age is imminent since Alaska is a foreshadow of global climate, but it only counts when Alaska is warming. Nothing to see here, move along. Alll the heat has obviously gone into the oceans which are warming up. In balance the planet is still heating up. Is what the GW dimwits will tell you. Not only are there no data to support that, it also would imply that the laws of thermodynamics have been turned inside out with heat flowing to the warmth and away from the cold. I believe that Alaskans use zero as a temperature reference point, i.e., 10 degrees below zero or 10 degrees above zero. From the Fairbanks Daily News-Miner there is this: The low temperature at Fairbanks International Airport was 2 degrees above zero, which obliterated the old record of 8 above set in 1924. New records were set at Eagle (5 below), Eielson Air Force Base (1 above) and Delta Junction (3 above). It has probably been used for so long it just comes out naturally while speaking. I can imagine that long ago when they first got telephone service there the conversation may have been along the lines: Yep, got a bit chilly this morning, was 40 degrees outside. The person at the other end of the call: Hey, that’s not cold. Alaskan says: 40 degrees below zero! Don’t tell me ! Hail is warm rain.!! Steve Keohane wrote about Loveland / Ft. Collins snow. Yes, Steve, we have 6-7″ of global warming stacked on top of tables, chairs, cars, bushes, etc. It’s still snowing hard. Hope I don’t lose too many branches due to the snow. Steve Lohr wrote about 30″ dumps in Colorado. Are you referring to the dump around Oct 27, 1997 or March 21, 2003? The fahrenheit scale works just fine, and if it aint broke, don’t fix it is my motto. Besides, can you imagine a book with the title “Celsius 232.77”? For those worried about the cold, I will bet a C-Note that this months anomalies will not only be enormously positive, but will be higher than last months positive anomalies, and the news will still call this the top 10 hottest on record..
And the ignorance of most people in the “rest of the world” is our problem…how? The fahrenheit scale works just fine, and if it aint broke, don’t fix it is my motto. Besides, can you imagine a book with the title “Celsius 232.77″? But movie “Fahrenheit 9/11” is better “Celsius -1715/99” 🙂 ! How about “tuna fish”? Is that only in America too? It’s just that…here in Alaska…we can’t help bragging a little…when we get above zero. In addition to potentially higher ethanol fuel costs the other effect of a big hit on the Corn crop would be higher food prices. Time to drop the immoral unsustainable ethanol subsidies and mandated fuel blend regulations. I watched that CBC weather report and they included the term “Wacky” in their on screen visuals. So they are still trying to push the CAGW theme. Nearly right, but in fact the world had but one temperature scale and then that Fahrenheit fellows came along and mucked things up by introducing a second illogical scale. Look up Romer temperature scale. Interesting that while you guys up in the NH are struggling to get from winter to spring, down here we seem to be holding onto daytime summer temps quite well so far. 28C yesterday, nearly a May 1st record. Nights and mornings are starting to get a big cooler though. After uprooting and transplanting a balsam fir, from its (not) National Forest in northern Wisconsin to the Chicago suburbs, I have noted the following times of its “bud” breaks. (in its new Chicago climes). Some lakes in northern Wisconsin will be iced over for the traditional fishing opener (first Saturday in May), which hasn’t happened in a while, if memory serves. It used to be, and not too long ago, from my personal experiences, that in the environs around Denver, May 9th was the magic date for seedlings. If you put them out earler, or they poked out of the soil before then, they risked being frozen and you lost your annual garden or crops.. If you waited until May 15th, it was safer, but you lost a week of growing season. 31 degrees and snow for Denver on May 1st is normal climate variation. Nothing to see here, move along. The tax funded climate industry and their academic groupies couldnt give a flying fig that their religion is based on computer model junk science..
Whats climate science to do?. Push Meteorologists out the side door and rake in billions delivering the 3 day forecast?.. Its doom or nothing for this sad excuse of a industry, so they will not be changing their minds any time soon..
Got to love our Canadian cousins who went metric in the seventies yet blog on about several feet of snow. Is this so our American nephews living in the only developed non metric nation can understand? All those complex pesky Napoleonesqe decimals! Meantime Andy55 my part of Aussie Newcastle is nearer 24F than 24C that’s above zero for imperial Steve in the UK and the winds blowing a gale; speed maybe 5000 rods per light year? A cold spring doesn’t count if it came at the end of a warm winter and before some warm summer. 2008 and 2011 were real late corn plantings. “Knee high by July” as the farmers say. If it gets into June planting then the yields do get progressively worse. But I’d recommend the other golden opportunity right now. IAG, loading up the truck. GLD, SLV shiney niblets. I remember looking out the window at Stearns-Roger in June of ’73 or ’74 and watching the snow come down. Around these parts it’s tuna fishing . Also , I may be unfair to my compatriots – in my few travels abroad I’ve never discussed safe deposit boxes or water heaters . Thank god no hysteria on the Weather Channel… like the one day in April it broke 70 in Chicago an Al Roker was flailing around like Ron Jeremey on a money shot. Whooo boy! That analogy is a real stretch…. Brian Williams-NBC Nightly News- gave the mid-west cold and snow 30 seconds on their 6pm broadcast. Just saying. falls flat on its face. This year’s freakishly cold/wet April (and maybe May) no more disproves AGW than last year’s freakishly warm/dry March proved it. The warmers of course seized upon last year’s warm spell, as they had to since these weather events are literally the only play they have left. But I would hope that “…the world’s most viewed climate website”, whose posters and commenters claim to be skeptics, would do a little better; plus, we realists don’t need to hurt our credibility by cherry-picking – the trends, in both temperatures & extreme weather events, are either flat or slightly declining. As Solar Cycle 24 fades to zip-squat twelve months from now, evidence mounts that 2014 will see the start of a 70-year “dead sun” Grand Solar Minimum similar to that of 1645 – 1715. At its deepest in the mid-1690s this Little Ice Age climacteric brought years of famine to Northern Europe from Scotland to the Urals, depopulating some regions by 60 – 80%– proportions far higher than Ireland’s “Great Hunger” in the 1840s. The fact that insular and obtuse global governments have not only blindfolded themselves to this reality, but literally sabotaged coal, oil, and nuclear-power resources over forty years, is tantamount to genocidal mass-murder worthy of a Lenin, Stalin, Mao T’se-tung. Until populations in general realize that AGW Catastrophism hates humanity and wants them dead, just so long will the Green Gang hasten post-Enlightenment civilization to oblivion. Hard frost on the grass this morning, just a bit south of Seattle WA. The late frosts we had the last two springs have apparently convinced my plum trees to delay their blooming enthusiasms this year. Not a blossom showing yet…. I’m hoping for a good plum harvest this year, as I’m running low on both plum jam and plum wine. I have plenty of light plum vinegar though, as last years 5 gallon batch of wine ‘went south’ on me! Makes tasty vinaigrette dressings and sauces…. but I’d rather have the wine. How many countries in the world use fahrenheit officially?? One? Time to get with it USA!! Sorry, but the entire world must conform to the U.S.! Thanks…. spoiled my dinner… may never get that image out of my head. As an engineer, I am equally comfortable using Metric and English units. For sciency stuff metric is easier to use, but on a day to day basis some units make more sense for things you can feel. For example, since Farenheight and Feet are smaller units than Celcius and Meters,it means something more to me when discussing 80 to 85 degrees F outside the difference between 26.6 and 29.4C…its not a huge difference, but humans can perceive the difference between 1F. Also 100 degrees just seems like a lot compared to 37. Also 10 feet of snow seems like a lot compared to 3 meters. I know its an irrational explanation, but for things like this the larger numbers provides a greater sense of scale, It’s like mount everest at 28,000 feet sounds a lot cooler than 8536 meters, and differences in height of mountains sounds easier to grasp when they are measured in thousands instead of hundreds. As far as miles versus kilometers, I don’t care either way. The research was shortlived. It was intended to provide better predictions of spring runoff in this region. I left the USGS in 1978. However, I offered the observation here as a way of suggesting that the “early springs” or “late springs” might be better explained as the shifting of the phase of this second harmonic, rather than as a warming of the annual cycle. Someone on this thread wrote about paying now for the warm winter weather, and that too relates to this phase shift. Now why the shifting phase, and what it might have to do with “climate change”, I don’t know. Speak for yourself. It has been going on for a while. Four years ago I started a job in Hamburg, amongst a bunch of warmist engineers. For fun, and because I knew about the big solar minimum and the Svensmark hypothesis, I told them that it’ll be a cold winter, et voila, Hamburg was all iced over that winter, and the next as well. The year after that they had their first Altereisvergnuegen for several decades, that’s a party on the frozen Alster, the lake in Hamburg. And this winter in Germany has been too long, temperatures in March and April are way below normal. Of course, I expect several more decades of this. We’re having a Grand Minimum, and CO2 does absolutely nothing to warm the planet. As somebody stated, H2O and CO2 are the only two gases that emit IR from the atmosphere to space, so that says that an Earth without CO2 and H2O in the atmosphere would be incapable of radiatively cooling its atmosphere. Is CO2 therefore responsible for a 33 deg C warming of the planet? That sounds to me more and more like a fairytale because the people who spread this fairytale never computed the alternate system, in which the atmosphere could only cool by giving heat to the surface which could then radiate IR to space. Such a planet would have an atmosphere hotter than the surface. I have some ‘Hot Tuna’ here and love listening to it. Would you rather they refer to it as ‘tepid water heater’? In America’s south, skiing refers to ‘water skiing’, up in the northern states, skiing means hitting the snowy slopes and ‘water skiing’ is the explicit statement. Most everyone I know calls safe deposit boxes, safe deposit boxes… It all depends where in America one is, each region and often locales within a region have their own quirks. On a plant inspection trip to Massachusetts a co-worker ordered a ‘milkshake’. I tried to get him to change the order as I knew what he was going to get, i.e. ‘power shaken slightly sweet milk’ is not what he was expecting, ice cream and milk blended smooth and thick. Whether it’s pop, tonic or soda, it’s a drink; bagged or sacked groceries or whether you’re saving them or putting them away, linguistic quirks are common. I’ve lived or visited for extended periods various American locales and I quickly learned to not order hoagies north of New York (They broil sandwiches, limp lettuce, yuk), or accept meatball sandwiches ‘dressed’ in New Orleans; dressed means everything added, especially mayonnaise. Nor do I order ‘milk shakes’ north of New York, even frappes are not thick or flavorful enough; I rather just order ice cream. Cold coming as in possible freeze. darn! I just moved all of my orchids and tenders tropical outside. I think that around here, May 7th is the last day for historical killing frosts, so I guess I should’ve known. Corn does not generate well when soil temperatures are low; so farmers check soil temperature and use that as the guide for when to plant. Corn planted too early may lose some kernels to fungus, but more irritating to the farmer is that the corn will sprout unevenly so the crop will mature unevenly. The other danger is all of the plants that have already flowered and set fruit. I guess I can expect a complete loss of peaches, plums, nectarines and cherries this year. Good news is that the pea crops like cool weather. I sure hope that people are choosing rails carefully in a number of climate research locations. It used to be a somewhat American tradition that, when caught, shysters, con artists, flim flammers, cheats and similar were well doused in tar, covered with feathers and run out of town on a rail. Collect those old feather pillows, keep the tar hot an ready and make sure the rail is fresh split, rough and splintery. Rails are a reference to fence rails split from trees, often pine; rails are triangular and of course the bark edge is what lies on the good citizens shoulders and they transport the tarred and feathered out of town. When the tar cools sufficiently, it an be slowly peeled off; think hot wax treatment only much more severe. There that should be a warming thought as we ponder those who deserve the treatment. In the rest of the world, they changed their temperature scale. In the Unites States, the temperature scale changes you! Umm, we don’t particularly like following others, this is something folks can’t seem to understand. The way you folks in Oz suddenly up’d and changed your entire system to join others and is not appealing to us. Centigrade and Metric are human designed arbitrary systems no better than anything else. The only reasons for switching we ever hear is that “Hey, 10’s are easier for everyone” and/or “Well, everyone else is doing it“. Besides, it’s real simple to explain the difference to the young’ins these days. Take a look at your cellphone or laptop Wi-Fi signal strength or battery meter and explain why using a basis of 5 bars is better than 10 bars. The world is full of examples of arbitrary systems used for tradition or whatever reason. In microcomputers we mostly use base 16 hexadecimal providing a larger quantity in a smaller space which is a fine example where base 10 just will not do and their are many other bases as well. If we switch school grading from A, B, C … F with + and – to a pure 100 percentage basis ( or perhaps 1-10 ) things might be nice and uniform but nothing is really gained and some tradition and character is lost. No-one has anything against Centigrade, and as others pointed out we happily multi-task over here. Trying to get us to change because others cannot multi-task or are troubled by simple math does not compute. Personally I don’t think basing everything on base 10 math ( or “Tensies” as we called them in grade school because they were the easy ones 😉 is a great selling point because it reeks of pandering to the math-challenged, or, conforming to elitist group-think. We don’t do that. Nope, its funding making the changes. F scale has 180 degrees between freezing and boiling. C scale has only 100 degrees. F is accurate using whole numbers while C scale is almost twice as likely to need a decimal to identify the same temperature. F being more relatable – presists. Missing CO2 created water vapor here in NE Oregon! Down to 18% humidity under clear skies and ANOTHER freeze warning tonight. My long red hair is standing up like it has been wired to Frankinstein’s static electricity machine! The lilac buds frooze. My poor dogs don’t dare sniff the local text messages on fire hydrants because their noses get snapped! Canola farmer’s are starting to panic on the canadian prairies as they need at least 1400 growing degree days to maturity and the ground is frozen. It might be a struggled getting there and it appears the polar vortex will be sending another cold finger down through the prairies next week. Those aren’t text messages; those are p-mail. Thanks for that! I needed a laugh. When its frozen, its like getting that darn notice on your door knob from FedEx when your not home. You know somethings there, but you can’t quite get it yet. .
Might be time to start looking at those recordsfor the last day of snow for many cities soon. My hunch is the rapid reaction in Arctic sea ice recovery, as it relates to the loss due to the storm in early October, and the shifting PDO, are a few of the cold culprits. Since there has been NO statistically significant warming trend over the past 16 years and 4 months, I love how the CAGW grant whores have resorted to ranking years rather than discussing the LACK of a warming trend. Using this new and improved childish ranking system, one could also say that since Homo sapiens started walking the Earth 200,000 years ago, the past 16 years are ranked 1st through 16th for the MOST man made CO2 emissions with no global warming trend in 200,000 years and the last 10 years can be ranked 1st through 10th for the MOST manmade CO2 emissions with a FALLING global temperature trend….. When grant whores have to resort to ranking years rather than discussing the LACK of warming trend with record manmade CO2 emissions, you know it’s the beginning of the end is near for this silly theory. Who doesn’t like to take stories like this and send them to our “warmist buddies” just to kick em in the ribs now and than? Granted its just as bad as claiming “a warm spell” is the end of the world and because of evil man, but shrug, we probably as a species have not evolved as much as we want to believe…. Cave men saw “terrible storms” as proof of evil and bad things caused by “the flavor of the month deity”. Now we have large segments of our population saying that “terrible storms” are proof that “evil carbon from man” is destroying the world. The more we change, the more it seems we just stay the same with irrational beliefs about the world and how the world revolves around us. 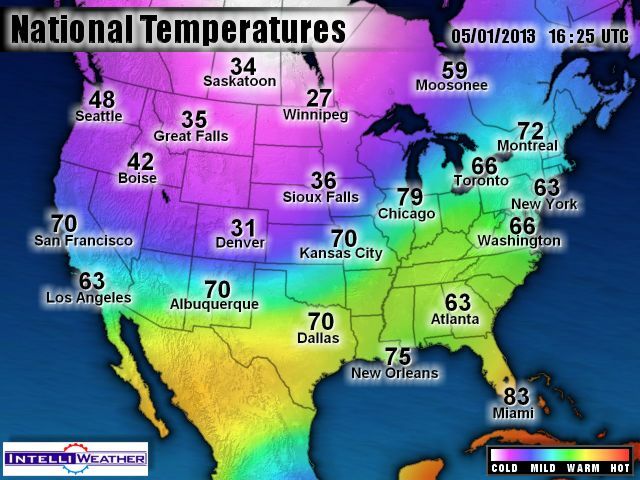 Y’know, if this IS global cooling, Texas is gonna turn into a pretty sweet place to live. Well, sweeter than it is already! And we’re gonna have all that oil and gas that those yankees up north are gonna have to keep paying us for. heh. wws, Guess you never heard of the Bakken formation, the Utica shale or what’$ going on in Pennsylvania? Or that Calumet & MDU Resources are building a refinery in N. Dakota. That Canada should just pump their oil their own refineries in the east and stop importing crude, because by five years from now we cannot make room for it. Here in Dubai we have had a week of rain. Rain occurs here but it is really unusual for it to happen late April / early May. NOT politically correct now, is it? Ha! Ha! So cold here in Wales that a radio tagged cuckoo ( called David) flew to Ceredigion in Mid Wales , then turned back and flew to France! A Ceredigion cuckoo returning from migration in Africa takes a holiday in France to avoid the British weather. Farenheit used mercury in his thermometers and devised a scale which was very accurate, had a constant zero ( freezing point of a saturated solution of brine) and is far better than the Celcius scale. Bread? They grow cornahol now. Resourceguy suggests $5 gasoline. With no cornahol, there will be NO gasoline. The government demands gasoline must contain 10% alcohol. No alky, no gas. I have been growing perennials in my garden for many years here in Denver. As a Denver native, I have grown accustomed to spring snow storms for as long as I can remember. However, our snowstorms in the spring are warm, wet affairs. You can expect the plants to enjoy the extra boost of moisture when this occurs, basically shrugging of the chills by the next morning. This is the first time my Virginia Bluebells have experienced frost damage. The Bleeding Hearts are already history, although they always struggle in the spring. As I write this, I’m hoping I can salvage some of my lupine with sheets and lamps. There is severe frost damage on the early leaves, something I have never seen on lupine before. We are definitely experiencing a cold, wet spring of unusual extent this year. The last few storms are something we normally experience in Feb or even Jan. I wonder if all of this is a indication we are entering a Dalton or Maunder type cooling period? The sun is definitely lazy during this cycle and it seems more than coincidence we are seeing cool, damaging springs. Only time will tell. I enjoyed the reference to Stearns and Rogers in 73 or 74. Only someone living here prior to the 80s would have those memories. Same for Celebrity Sports Center. Here n southern Minnesota we will set a record cold high today as well as all-time May snowfall (was 2″) total with 8″ of snow on the ground and another 5-8″ on the way. We even get a visit from The Weather Channel talking about “climate extremes”. Ugh. Well, that’s caused by last fall’s sea-ice melt, dontcha-know? These regional cold areas are just a start of many cold periods ahead. Solar sunspot activity is at the lowest level since 1900. During the decades of 1880, 1890 and 1900 the average sunspot numbers [NSO] were 45.2, 55.1 and 42.6. During 2000 decade they were 49.6. During the last 10 years the average sunspot number was 29.3. When the average decadal solar level drops to about 40-50 , cooler weather sets in. Low solar sunspot numbers seem to correlate with low global surface temperatures especially when ocean and solar cycles are both in sync and declining. Low solar cycles typically come in threes, so it is possible that low sunspot numbers may exist for several decades into the future There are 11, 22, 70-80, 200 year and even longer solar cycles. There are 30, 60, 120 year and even longer climate cycles that emerge from sun/ocean interface. The minimums of the longer solar cycles are deeper and more severe or colder than the short ones. The last 6 solar minimums were about 1290-1350,1400-1520, 1640-1710 , 1790-1830, 1880-1915 .Every 120-185 years we seem to have the start of a major minimum and a colder period that lasts for 30-90 years .There seemed to have been a cold temperature trough every 120 years as it was very cold in 1550, 1670, 1790, 1910 [.predicting 2030 as cold trough period?] .It looks like we may be entering one of those 120-180 year cycle colder temperature periods either now[1880+120=2000 or by 2060[ 1880+180=2060]. 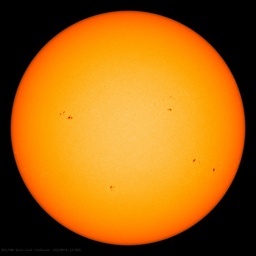 If sunspots go to zero by 2015 , the much colder winters will set in. Warming is Global. A computer program run is all it takes to prove that it’s warming. The computer program output overrides thermometers, as thermometers are faulty. Cooling is always regional. All eyewithness reports of extraordinary cold are unscientific anecdotal cherry-picked evidence. And probably forged anyway. Unheard of major snow in Iowa this morning. Now we are starting to get to the point where late planting could effect corn yields, particularly if the cold wet ground remains as germination of seed can be effected. Yeah, but you gotta get the CO2 really hot first then it absorbs so much heat it snows. I saw 68 on Monday and I got 6 inches of measurable stuff on my deck. 5 inches of it is still there now. Seems that this late cold weather may diminish crop yields in the midwest. Could be worse than last years drought, though it is too early to say for sure. However, last year’s drought is not consonant with global warming because a warmer globe means higher levels of humidity, not drought. We know that this is true, because that is what the confraternity of climate modelers and global warmers say. This is confirmed by other, more believable scientists. We hosted an exchange student from Chile one winter several years ago. As the temperature dived during one of our typical Wisconsin cold spells, I would tell him the temp in Fahrenheit and he’d ask for the conversion to Centigrade to get his bearings. We routinely have a few days that hit 20 below zero (Fahrenheit) each winter, and overnight might hit 30 below. I recall one day telling him that the early morning temperature as he was preparing for school was -40 degrees, and when he asked whether that was F or C, I told him “both.” Fortunately, that doesn’t happen here every winter. Another story: I used to walk past a bank clock that would print out the temp in degrees C, and then the time, and then the temp in degrees F, seconds later. I got pretty good at doing the C to F calculation before the clock told me the answer. I’d just double the degrees C, slide the decimal point to the left one column and subtract that, then add 32. So, for example, 20 degrees C was: 40-4.0=36+32=68, and 34.4C was 68.8-6.9=61.9+32=93.9F. Going the other way was tougher though. Fahrenheit is a human scale, i.e. 100° was seen as the hottest day and 0 was approximately the coldest. Celsius is a scientific scale, based on the properties of water. It is also digital, which means that it is based upon the number of fingers on the typical human hand. The choice between the two is purely arbitrary and political. Americans, as in many things, have chosen the more human scale. In America we have experienced 0° days and 100° days, and thus know that Daniel Fahrenheit got it right. One June, in Delhi, I saw that it was almost reaching 50° every day, which the locals called a heat wave. I’d rather say that it was about 20° hotter than a human being could stand than that it was half way to boiling distilled water. Rather more useful to humans, eh? And FWIW, IMHO Rankine would be better for scientists than Celsius, since it is more precise and a bit less arbitrary. What’s so great about water anyway? Or rather, distilled water at standard temperature and pressure. Bit of a mouthful, eh? …As somebody stated, H2O and CO2 are the only two gases that emit IR from the atmosphere to space, so that says that an Earth without CO2 and H2O in the atmosphere would be incapable of radiatively cooling its atmosphere. Is CO2 therefore responsible for a 33 deg C warming of the planet? That sounds to me more and more like a fairytale because the people who spread this fairytale never computed the alternate system, in which the atmosphere could only cool by giving heat to the surface which could then radiate IR to space. Such a planet would have an atmosphere hotter than the surface. What is left out is the time interval during which greenhouse gases act. If you look at a comparison of the humid Brazilian rain forest and the dry N. African Desert it is obvious the effect of the addition of water vapor (GHG) is not to raise the temperature but to significantly lower the diurnal range of the temperature. The monthly high is 10C lower and the monthly low is ~ 10C higher in Barcelos, Brazil than in Adrar, Algeria in May. Water (and CO2) act as a ‘coolant’ in the day time by absorbing and redirecting incoming sunlight and as an ‘insulator’ in the night time by absorbing and redirecting outgoing earthshine. Hat tip to Sleepalot @ July 21, 2012 at 4:53 am who first pointed out the actual effects of the GHG water vapor on the temperature by comparing high vs low humidity in those towns. …. And we’re gonna have all that oil and gas that those yankees up north are gonna have to keep paying us for. heh. ERRRrrrr, My farm is sitting on top of the Triassic Basin shale gas formation in North Carolina so this Yank is not really worried. No reply from WWS… yep, you can always tell a Texan, but you can never tell him much. They have ears but they don’t listen. Ever heard of Ron Paul corn? Doesn’t make much corn but it sure has big ears. Just like Ross Perot corn… makes niblets but sure has big ears. Then there’s Bush’s best corn. A highly invasive species that occupies other countries and collapses the world markets, corny I know, but it has to be said. And as I look out the window here in NW Europe, there is still not a single leaf on the trees. Come on, chaps, this is May. How can they still be talking about global warming with a straight face? There was too on a BBC report from northern UK a couple of days ago – a great pile left by the snowploughs in a hospital car-park. But the really comical thing was that the BBC cameraman was doing everything possible to keep it out of shot. It was only the newspaper still that showed it. Typical Biased Broadcasting Corporation (BBC) – only the best propaganda is good enough for them. I wish some of that cool air would drift this way. Going to be in the upper 90s with crazy winds today in Southern California. John, the Inconveinent Skeptic may have the physics behind that figured out. …Now for something interesting. In January the anomaly in the Arctic was well above average. By simple physics that meant the Arctic was losing energy to space at a much higher rate than average. Normally the Arctic is losing energy at a rate of 163 W/m^2. In January of 2013 it was losing energy at a rate of 173 W/m^2. That 6% increase in rate of energy loss meant that the Arctic ended up with a negative anomaly in February. The dramatic change in Arctic anomaly played a big role in the drop of the global anomaly in February. The rate of energy loss is a self-correcting mechanism. Physics don’t allow it to operate in any other way. As a whole the Earth lost ~ 4 W/m^2 more than average over the entire surface in the month of January. Data for February is not yet available, but it will be close to average because the anomaly was closer to average. The higher rate of energy loss in January resulted in a more average February. That is how the climate operates. Finally I have to get a dig in at CO2. In January of 2013 it was 395 ppm and in 1985 it was 50 points lower at 345 ppm. So despite the fact that CO2 was higher, the Earth was losing energy at a higher rate to space. CO2 was not blocking the energy from escaping despite all the claims that increased CO2 prevents heat from escaping the Earth. The Earth 30 years later was losing a significantly larger amount of energy to space than it was in the past. We use the metrics that best fit our situation. Meters are an ungraspable measure, as are cm, to those used to feet and inches. 3 feet of snow is like 1 meter, however 1 foot of snow is like 30cm, an essentially useless number. I still think in both F and C, so for temperature I’m somewhat bilingual. The speedo in my car reads in km/h, but all the rest is in US, since to me MPG makes more sense than l/100km (higher number = better mileage). Even some branches of government backed off on that total immersion idea, for example building plans for permits are accepted using feet and inches. Metric in Canada – the mind is a funny thing as it can be conditioned to certain ways of thinking. I grew up in feet and inches and all through school I never really thought about the fact that most of our science was done in metric units or even mixed units and it was the same in University. When the government changed everything to metric they came out with standards for engineering drawings and even the spelling of METRE for a unit of distance and METER for a measurement device. As a result, I think in millimetres, metres and kilometres (and everyone still talks feet inches and miles as the whole of the prairies west of some point in Manitoba were surveyed in 1 mile by 2 mile blocks so there is always a road allowance every mile east west and every 2 miles north south). But what is interesting, whenever I hear someone use centimetres, I convert to millimetres first because for 40 years I worked only in centimetres and metres so my “mind” knows that four feet is roughly 1600 mm, a foot is 300 mm, six inches is 150 mm and so on. Not exactly, but as an example the culverts I have crossing the creek on my farm are 900 mm culverts (approx. 3 feet). So it all depends how your brain has been trained. If someone told me they had a 90 cm culvert, my brain would have to change it to 900 mm to visualize it and while odd, that is how it is. Course, in Alberta we have a funny thing of doing distance. If someone says how far is it to the next town, you might get “10 minutes” rather than 10 miles or 16 kilometres as people on the prairies tend to think of distance in terms of travel time. The brain is a wonderful thing. Why have zero below 0 C? Because the salt mix used gives a CONSTANT zero. Plain water freezes at many different temperatures, depending on all sorts of things… so you can’t get a constant calibration point with it. This definition fixes the magnitude of both the degree Celsius and the kelvin as precisely 1 part in 273.16 (approximately 0.00366) of the difference between absolute zero and the triple point of water. Thus, it sets the magnitude of one degree Celsius and that of one kelvin as exactly the same. As of now, the Celsius degree is just a special form of Kelvin. (Yes, I capitalize it. Get over it… I choose to honor the man.) So it’s changed direction, changed calibration, and is now defined in terms of a different scale. I think I’ll stick with F thanks… folks don’t screw around with it as much and the prissy “rules” on how to capitalize or use it are much looser (read: human comfortable). In 1742 Swedish astronomer Anders Celsius (1701–1744) originally created a “reversed” version of the modern Celsius temperature scale wherein zero represented the boiling point of water and one hundred represented the freezing point of water. And just FYI, the English Foot is also rather stable. And NOT based on the size of anyone’s foot. Why use things with 360 units, 60 units, 12 units, 180 divisions (F between 212 and 32…)? They are easy to divide and factor rich. Fractional math is a whole lot easier than decimal math and you can keep infinite precision. (Until and unless you choose to reduce the fraction to a decimal value). So what’s 1/3 in decimals? An infinite series… 1/3 of a foot is 4 inches. 1/3 of yard is one foot. Exact. One third of a meter is?… 33.333333333333333 just keep going… cm. The “old measures” had many such “conveniences” built into them. As I do a lot of “mental arithmetic” I find the “old conveniences” very convenient… Even the old values for Pi as a fraction have that convenience. You can choose your precision by what fraction to use, and then it’s all just fraction math to simplify fractions. At the end, you can leave it a fraction or do one long division as you like it. 22/7 for most things is fine. 333/106 is more precise. Then any of 335/113 or 52163/16604 or even more if more precision is desired. So a circle of 1 foot radius has a 44/7 circumference. Want more precision? Then it is a 666/106 circumference. or a 104326/16604 circumference. No calculator needed. One of the ‘complaints’ about the foot (and the cubit) was that there were several variations in length. Chase that back a ways, you find an ancient use. Navigation was done via the stars and degrees. At different latitudes, those give different distances (or vs longitude). The makers of the Meter ran into some of the same issues (and the meter is wrong as a result) when attempting to make it a standard based on the earth from pole to equator. What the ancients did was to build in some calculations into different ‘rulers’. So some “cubits” are square root of 2 of some others. Useful when making 45 degree slopes on pyramids or roofs. Other units have a Pi relationship built in (for making henges and such round things). So yes, I’m sticking with the Foot, that has at least a 5000 year history of stability, and perhaps longer. With the night sky, two sticks, and a bit of string with a rock on the end I can recreate the Pole/Perch/Rod and from that a variety of feet and cubit measures with very high repeatability and precision limited only by my skill. I don’t need to ask someone to make a krypton laser and send me a copy of the specific count of waves, nor even run off to France and measure against a platinum rod. For all practical purposes, I can make a ‘good enough’ and STANDARD unit even under primitive conditions and even if isolated on an island somewhere. As a “teaser” and showing where I’m looking now, the Babylonians had 2 kinds of cubit. The Lagash cubit of 496.1 mm and the “trade cubit” of 446.5 mm. These looks semi-random in our modern mm measures. Yet the Lagash cubit, if divided into a 6 second pendulum yields 18.023 and the “trade cubit” divided into the 6 second pendulum gives 20.025. That both are darned near ’round numbers’ is interesting (to put it mildly). That one is a factor of 3 x 6 while the other is 2 x 10 is also of interest. Though they got the sizes 2 times too large… and the meter is off fractionally. But for folks who are unable to handle more than one thing, I do use metric when needed; but it really would be beneficial if you were to learn that there is more to the world than Just On Mandated Standard. And very often those older systems were much more convenient to create and to use. We, globally, rejected the “Decimalized Clock” that was proposed at the same time for the simple reason that it is hard to make fractions on one and the units were too big. 8 hours is 1/3 of a day. Working 8 hours is more direct than saying 3.33333 repeating… of the “decimal hours”. Similarly the 10 months idea got trashed. Dozens are just more “factor rich” and make anything needing division simpler to do. That some of us like the same convenience in our linear measures and volumes is no surprise. So yes, we CAN do that decimal stuff and DO use it when it is benefit. The rest of the time we use what works better. For temperatures, F is just more convenient. Hardly ever a need for a decimal point, for one thing. Much more precision in whole digits. A range from 0 F at a point most folks don’t want to deal with any colder to 100 F at “quite hot enough thanks”, so anything outside that range is clearly “make preparations” range. For cooking, the oven goes to 200 F for slow cooking, 300 F for gentle roasting, 350 F for medium, 400 F for hot baking (biscuits and such), 450 F for Pizza and 500 F for specialty breads, pizzas and some meats. Nice neat divisions. For some things, I’ll drop a medium oven down to 325 F or up it to 375 F to get specific browning effects (breads mostly but some roast birds) and the Turkey often gets 275 F for a long slow roasting. So simple jumps by 100, then cut in half by 50s or quarters by 25s. Simple fractional relationships. One final note: It’s not just the USA who “uses what is convenient”. Aside from Belize and Caymans that also use F, some folks in Europe use “variety scales”. It may seems hard to believe on a 90 degree day, but a piece of this energy is prog’ed to retro into CA and provide a late season incident – at least some cold and even a bit of precip. I’m so pleased to find someone else agrees about the usefulness of the Fahrenheit scale for the weather. Here in the UK 0 degrees F is about as cold as it ever gets and 100 degrees F is about as hot as it ever gets, so a pretty perfect scale. Conversely, -17 to +38 doesn’t seem so sensible. Good thing we have transportation devices to move food around. Oh! wait – anti-human voters intend to take those away from us. As for high temperatures this time of year, I expect a significant spread as the sun is strong so warms the day a lot. Wierd spring on the mid-Wet coast, it froze a couple of weeks ago, today was over +22C high. As for wordings, my rule of thumb is that if someone says “dinner” for a noon meal they must have grown up in farming country east of some mountains. It makes more sense that they were mixing C with degrees F. 37degrees F is 2.7 degrees C. So that would be 2.7C about 0C.